Its good to be back. After 15 years we flew back in to Bangkok which is one of our favourite cities. Polluted, noisy, smelly, colourful and in your face it’s a sensory overload. If life seems pedestrian and in black and white, a visit here gives you full colour High Definition. Its a constant thrill to just wander around with your eyes, ears and especially your nose being assaulted. Monks, hawkers, tuktuk drivers, masseurs, office workers, food sellers, package holidaymakers, feral travellers and local shoppers all share pavement space in a city lived on the streets. At the risk of sounding nostalgic, 15 years ago, Kao San Road in Banglampu was the centre of the S E Asia backpacker scene, offering rooms, laundry services, visas, transport, nightlife and most importantly, pizza. 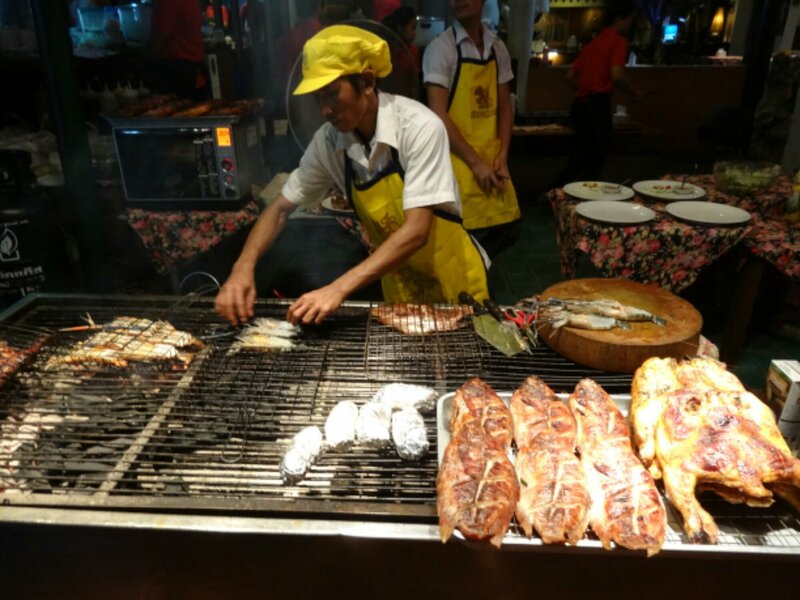 The next street over, Thanon Rambuttri had authentic Thai food stalls serving locals their evening meal. As everywhere, things have moved on and there are now additional services available. Kao San now has two mconalds, Boots the chemist and a starbucks and Burger King round the corner. On Thanon Rambuttri, the food stalls also offer pizza and have huge bars showing premier league football. 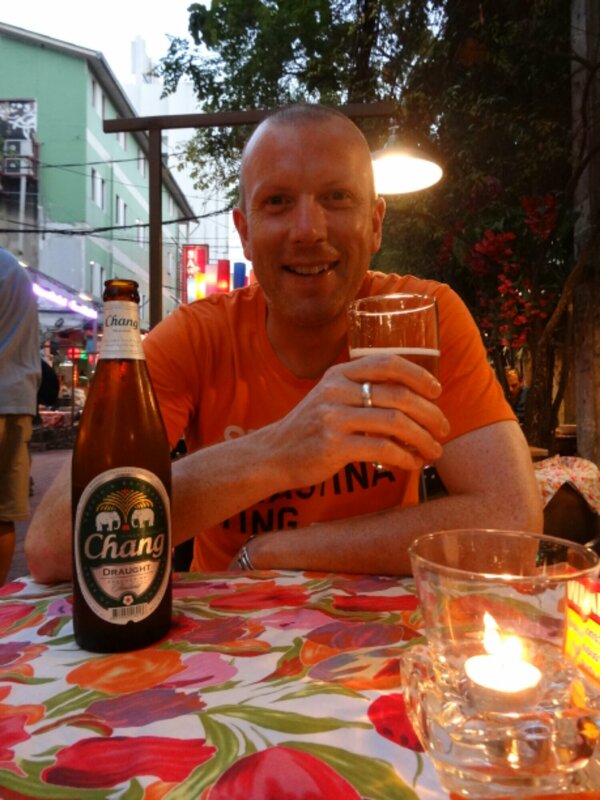 Other changes we have noticed are tourists drinking beer whilst walking about, doner kebab stalls, massage stalls, cashpoints everywhere, families of tourists (only backpackers before), long wheelbase tuktuks, and best of all, live acoustic music. We checked in to the same guesthouse we stayed at in 98 and caught the river taxi down to the post office to send a parcel home. We did this journey a lot before and we both felt like it was only yesterday that we were here. Time at its stretchy-ist. We wandered about trying to soak everything in and grazed at street food stalls. 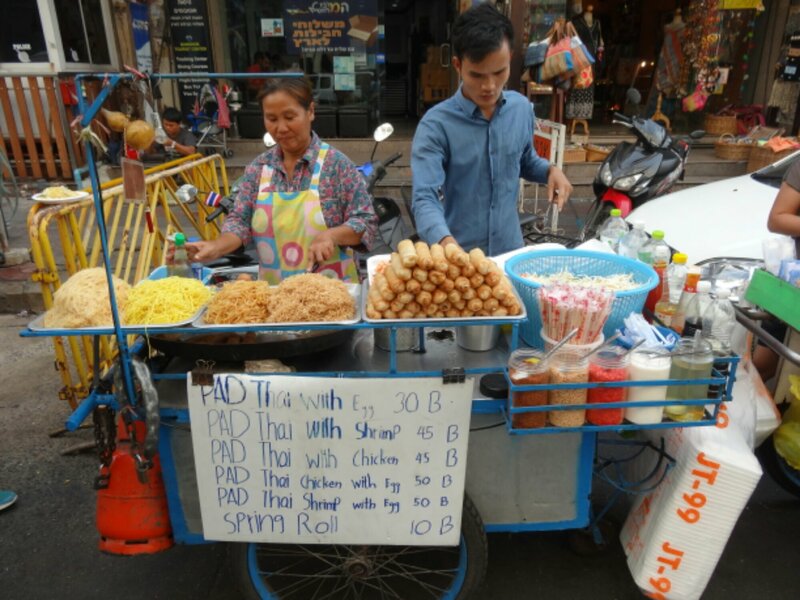 Its cheaper to eat out than cook at home so there are food stalls everywhere. 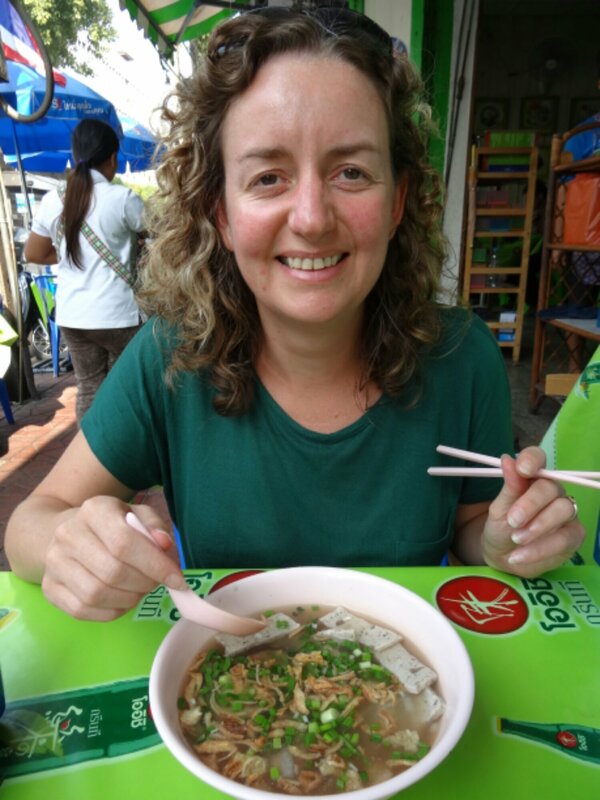 Al had a noodle soup with searingly hot chili (choking and a runny nose) and I opted for phad Thai, the national dish of fried noodles. Then a few cold beers. Chang, Leo and Singha. We ended up at a bar with live acoustic sets and after a month away loved hearing Radiohead, Chilli Peppers and rather aptly Jonny Cash’s Ring of Fire.